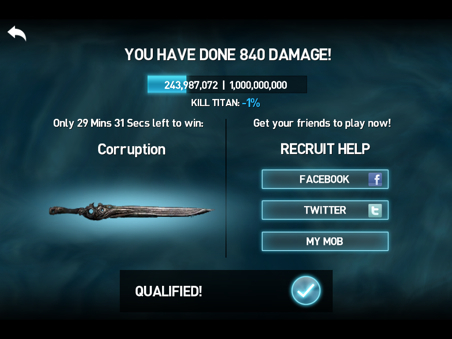 Infinity Blade 2 ClashMob Update: Worth The Wait? Undaunted, we dove helm first into the game's newest DLC. 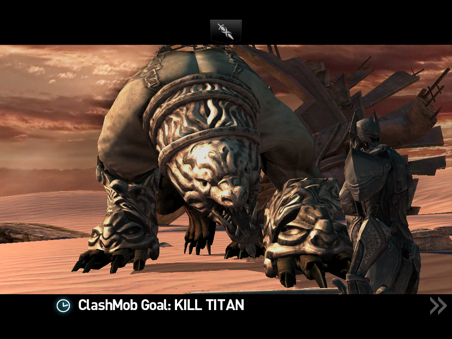 Yesterday marked the release of the long-awaited ClashMob update for ChAIR Entertainment's Infinity Blade 2. After failing to get the beta up and running on the new iPad, I turned to the iPad 2, which offered immediate access. First impression: Well that was quick. I played each of Friday's four challenges in roughly 10 minutes, and must wait until the next batch arrive, presumably tomorrow. Meanwhile, it remains to be seen whether my unknown cohorts' efforts will be enough to score that exclusive sword, which makes me a bit concerned. After all, I would hate to think I wasted a minute for nothing. That said, time to recap my experience. Upon launching the ClashMob beta, a screen appeared asking me to log into Facebook. This is a requirement, so if you're not down with this, ClashMob is basically not down with you. Why did ChAIR use Facebook? Because it automatically pulls your profile image and slaps it onto your in-game profile. This has less to do with aesthetics, and more to do with pooling your Infinity Blade Facebook friends into a mob, giving you the chance to see who's risked life and limb. On top of that, you receive bonuses depending on the number of friends playing ClashMob. These include a 1,000 coin bonus, an extra five seconds to complete a challenge and other rewards; you can recruit others to play via Facebook and Twitter. The challenges, meanwhile, take less than a minute to complete, and once you do that, the game officially locks you out of those challenges, leaving you to wait until the rest of the community succeeds or fails. What do these missions entail? Most times, just wailing away on monsters. The first objective, Clash of the Titan, forced me to battle a gigantic Lupun, dealing as much damage as possible before time expired. 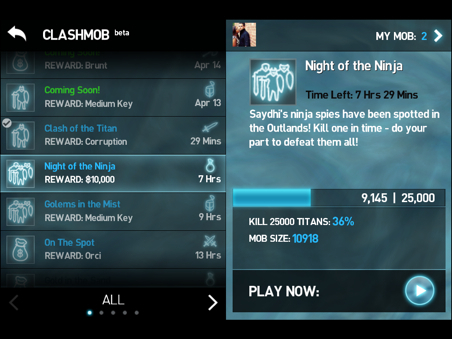 Another, Night of the Ninja, worked in similar fashion, but I had to kill the enemy. The same can also be said of Golems in the Mist. Same objective, different creature. Finally, On The Spot tasked me with grabbing as many bags of gold as possible before the counter hit zero. Just a simple touch mini game, really. What's especially cool about this is seeing the number of players currently involved, along with the progress; this remains constant across all challenges. You can also filter the info to see active missions, victories, losses and upcoming challenges, which you can then pre-register for. Again, it only takes a few minutes to breeze through the day's ClashMob games, and then it's done until the next day. A bit disappointing, considering the hype generated leading up to the DLC's release, but there's still a long way to go, and since this is technically a beta, ChAIR has plenty of time to boost this mode into something all Infinity Blade 2 fans will get into. At this point, I'm not even sure the developers know how this thing will evolve in the months and perhaps years ahead. For now, I'll come along for the ride, hoping my teammates do their part. They better, if they know what's good for them.